Barbell and dumbbell curls are just the tip of the iceberg when it comes to total bicep development. Sure, they’ll get you a long way, but if it’s attention to detail you’re wanting then you’re going to need to train them using a few more variations. While it’s no secret that barbell curls are the king of mass builder for the biceps, there’s many other exercises and variations that will help you turn that bulbous mass, into a chiseled, hard, granite-like arm, that mostly only comes with years and years of dedicated training. It’s always good to keep the basic mass builders within your workouts, as well as varying how they are performed (the first two exercises shown in the routine below are prime examples of this), but once you’ve reached your threshold within these two movements, it’s time to take it up a level and train them across a range of different angles, unilateral, and isolated ways. 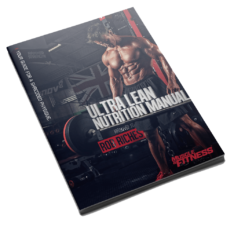 Keep reading to kickstart your next level of detailed bicep training. I want to highlight the first two movements in the program below. First off, the Olympic Bar Curls. You may not see this as being that different from a standard fixed-bar curl, but it is. Even without any weights on, just curling the Olympic Bar will place a different focus on your biceps, and if you’re abel to add any weight plates either side, you’ll soon start to feel the different even more. With the weights fixed further apart than normal, it changes the load on the biceps, more towards the outer bicep head. Don’t let you ego get caught up in trying to move more weight because you’re using the Olympic Bar, but rather focus on using greater form, with little to no momentum coming from your waist. The 2nd exercise: Rotation Dumbbell Curls, requires you to be sat on a bench holding a dumbbell in each hand, and with arms hanging at the side of your body, start with internally rotating your hands as much as you can (the your grip should be facing outwards away from the bench). This is how you start each rep. As you begin, rotate both hands back to a neutral position and start to curl both weights upwards as you continue to rotate at the wrists until your grip is facing you at the top of the rep. Pause and squeeze your biceps hard for a split second before returning back to the original starting position. After the first 6-12 months of starting out your workout routine, you’ll probably have made some decent gains and experience a lot progress. If lifting weights isn’t something you’ve been especially used to, then your body will make changes quickly as it adapts to the stresses of training to be able to handle it more efficiently with less effort required. This type of growth spurt can level off after the first year and leave many scratching their heads as to what went wrong, and even put them off from continuing to commit to their training and new-found healthy lifestyle. Put simply, the body has re-set it’s status-quo, and is now perfectly able at lifting those weights with greater ease than before – thanks to bigger and stronger muscle fibers that it’s grown as a result of being more efficient. This is great news, but the problem with many is that they don’t quite know how to keep this projected progression going, and it’s not as simple as just adding more weights each time. One of the biggest factors I’ve found to be beneficial is to be consciously aware when training, and really remain focused on every single rep you’re performing. By committing your mind and thoughts to lifting the weights through every rep, you’re more in-tune with whats really challenging you, and what’s just going through the motions. Learn to be in-tune with what your body is telling you through each movement. You’ll know if an exercise or set really did push you to your limit, and if it didn’t, try incorporating a shocking principle first before simply trying to force more weight. I try to always include a full range of motion when performing bicep exercises, but there are times when I’ll focus just on a limited range, such as only the first 2/3 of the rep on a preacher curl (which can help thicken out the lower region of the bicep), or even cheat a few final reps on some heavy barbell curls. Proper form and technique are always important, but sometimes it’s ok to break free a little from this, and use a little momentum to finish the set. This can be especially true if you’re performing some slow negatives after a grueling set of barbell or dumbbell curls, and need to throw the weight up in order to have the strength to resist it falling as you slowly control the descent back to starting position for several repetitions. There’s just something about curling a heavy barbell or getting those dumbbells up there, but there’s a big benefit to performing isolated bicep exercises as well. Not only will these force a specific range of motion, but they also tend to target a specific muscle head more so than the freedom you get of curling of the barbell. It also often requires a little less energy to perform isolated exercises, which means you can get the big, heavy, mass-builders finished with early in the workout when you have the most strength available, and then continue to keep tension and stress high on the biceps with several isolated movements, without necessary needing a heavy amount of weight. Don’t forget as well about including at least one unilateral arm movement within each workout. Whether it’s by performing alternative dumbbell curls, a single arm cable concentration curl, or angling your body so as to focus on one arm at a time during dumbbell preacher curls. All will work the bicep from a slightly different angle and pull, which over time can help you develop a very detailed arm then when pumped and lean, will look like it’s been chiseled from granite!